ShrinkTheWeb What does "Limit Reached" Mean? The "Limit Reached" system message means your monthly New Request or Bandwidth limit was exceeded. 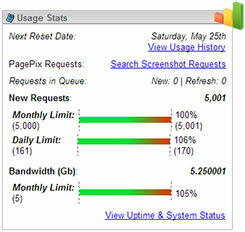 Your Monthly Limits can be viewed in the Usage Stats section of the ShrinkTheWeb Dashboard. If you need to increase your limit, you can do so by upgrading your account limits. Note: Once a limit is reached, all further requests are ignored. Each ignored request is counted and logged total of over-the-limit requests can be viewed in the usage stats section of the Dashboard. For non-paying accounts, we block all subsequent requests over a certain number past the limit. For paying accounts, that limit is much higher in order to give more time to upgrade.